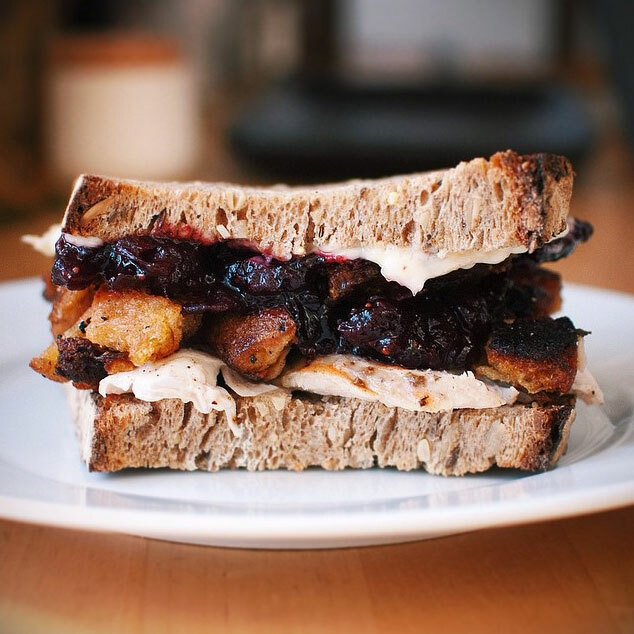 Here are 6 no-fail tips for turning your Thanksgiving leftovers sandwich into the edible extravaganza it deserves to be. For those of us who love food, Thanksgiving is a high holy day. No other American holiday is so overtly food-centric, nor as specific about the exact foods involved in the meal. But we all know Thanksgiving dinner is just the warm up for the main event: the Leftovers Sandwich. It’s sweet, it’s savory, and it’s one of the most delicious items in the American sandwich canon. The simplest version is turkey, cranberry sauce and bread. You could you stop there and have a perfectly good snack…but why would you? The Leftovers Sandwich only happens once a year; it deserves a little fanfare. Here are 6 ways to turn your Leftovers Sandwich into the edible extravaganza it deserves to be. 1. Fancify the cranberry sauce. With a few additions, you can make a quick cranberry mostarda—which sounds way fancier, right? To taste, combine leftover cranberry sauce, a little whole grain mustard, dijon, a pinch of cayenne and some grated orange zest. The mustard cuts the sugary cranberry sauce, while the cranberries mitigate the intensity of the mustard. You’ll still get the sweetness that goes so well with turkey, just with a little heat and complexity. 2. Make your mayo. For those of you who will be using mayonnaise on your sandwich (I know I'll be lathering it on), the homemade version is a game-changer. With its creamy texture and rich, egg-y flavor, it bears little resemblance to the storebought version we're used to. If you’ve never made it before, let culinary legend Jacques Pépin talk you through it. Bonus points if you add garlic and olive oil and call it aioli. 3. Two words: Potato. Pancakes. Mashed potatoes are great, but if you combine them with an egg and pan fry them, they turn into something even better: crispy, golden potato pancakes. They don’t have to be pretty (since they're going to get squished between two slices of bread), just crispy. The added texture will majorly upgrade your sandwich. 4. When in doubt, deep fry. If you're feeling adventurous and want to advance from pan frying to deep frying, you can really start to have fun. Do this with green, leafy things like herbs and Brussels sprouts (as long as they aren't too wet). Just pick a few leaves off and place them in a pot of 350°F neutral oil. Within seconds, they'll turn into crunchy green bits that will add flavor, texture and color to your sandwich. This works with a variety of herbs (parsley and sage are particularly good), but if you use something with a woody stem like rosemary, be sure to remove the leaves from the stem before eating. You know what else benefits from a quick deep fry? Turkey skin. What you worked so hard to roast to golden perfection yesterday is now wet and rubbery from a night in the fridge. Deep frying it will cause it to puff up and get crunchy, chicharrón style. (If you want to avoid the oil, try David Chang’s baked version here). For those of you who put potato chips on your sandwiches, it’s kind of like that…but better. 5. Buy better bread. This is probably the easiest upgrade you can make. Instead of using an anonymous sandwich loaf, try something with a little personality: maybe a tangy, crusty sourdough or a rye, whose spiciness complements the sweet and savory flavors of Thanksgiving so well. Once you have a worthy selection, get a nice light toast on it and start piling on your turkey and newly upgraded ingredients. We’re almost there! 6. Say (melted) cheese. Since everything is better with cheese, and cheese is almost always better melted, it follows that your sandwich will be better with melted cheese. Go with an Alpine style cheese like Gruyère or Comté; these cold-weather favorites melt beautifully and have enough flavor to stand up to everything else going on in your sandwich. Bonus: These cheeses are “in season” now, meaning they were made with milk from when the cows were grazing on summer grass and flowers, which can impart all kinds of interesting flavors. A few minutes under the broiler with a slice or two of that on top, and your sandwich is upgraded and good to go. The rest, as they say, is gravy (served on the side for dipping).